On Tuesday morning, we awoke to different weather — sunshine! Yes, come six o’clock the sun was pouring into our bedroom, which is the girls’ living room. They have very big windows facing east, you see. Of course, in the way of things here, the clouds and cool soon rolled in and even offered a few spits of rain during the day. Mostly though, it was cloudy and coolish, except when the sun re-appeared, which it did from time to time. Yes, weather changes with astonishing regularity in these parts. We had thought of going to Chinatown and the Sun Yat Sen gardens, or the anthropological museum, but neither greatly appealed on that morn. Likewise, I wasn’t overly enthusiastic about the other swing bridge — Capilano — although I imagine that we’ll brave it before we head back to Central Canada. 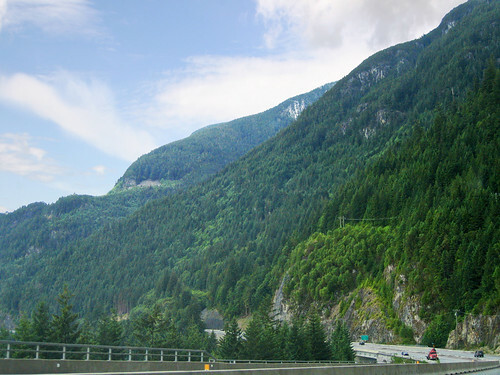 However, a local whom we met in the coffee shop the other day had opined that the drive along the Sea to Sky Highway from Vancouver to Squamish was quite a treat, so we opted for that as we rather like driving and seeing. 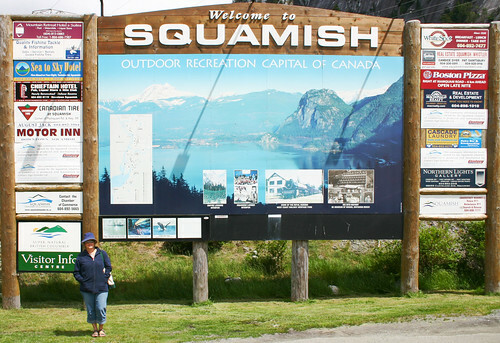 Squamish is a town on the way to Whistler which is where the alpine events of the 2010 Winter Olympics will take place. In preparation for the big event there is much construction all along the route, but that slowed traffic down which actually made for a better look at the scenery, so that wasn’t so very bad. I loved being in the mountains again, and this drive afforded both mountains and sea. Below, are two photos that Cuppa snapped from the moving car. However, although we did get as far as the welcome sign to Squamish, we didn’t get much further because traffic came to a virtual standstill. After a half hour with very little movement and seeing a huge line in front of us we did a three-point turn and headed back toward the city. The point of our outing was the journey and not the destination, so it wasn’t a disappointment to us. 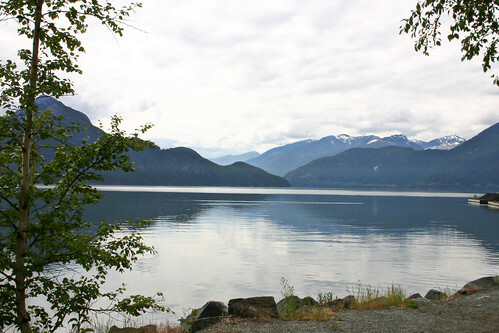 In fact, the best was yet to be, for we found ourselves pulling into Porteau Cove Provincial Park for a picnic lunch. The following three photos show the view that greeted us, and believe it or not, the island in the middle of the second photo is called Anvil. Yesterday was quite the treat. Indeed! 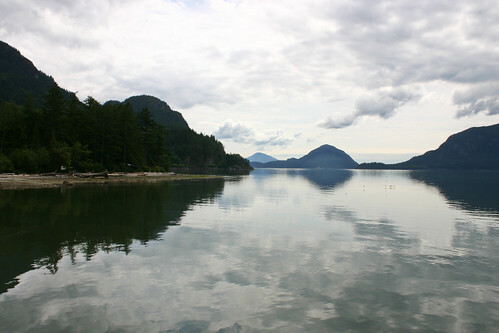 You saw some spectacular scenary- half named after an Island what fun!!! Great travelogue, AC. Fun to read and fun to peruse the photos. don’t you just love waking up with the sun at 6!! ben and i could never fall back asleep once the sun had risen. your pics are awsome. love them all. The view is just so spectacular. WOW. I’m just catching up after not visiting for a few days and it looks like you’re doing a great job of making the most of every moment in the west! What fun! Great pics! WOW! These photos are just beautiful, I can only imagine what these views must be like in reality. I’m so glad you and Cuppa are sharing your trip! Your photos of the trip are beautful. This does look like at great place to visit. You’re in my time zone! 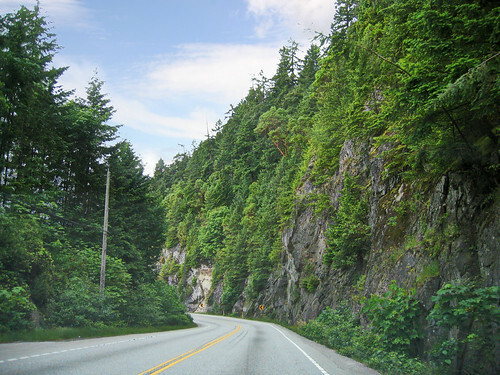 I remember driving along the Sea to Sky Highway when I was about 8 years old…I found it amazing even then. Thanks for the beautiful pics…my memory has been jogged!